Orchidaceae is one of the largest families of flowering plants. Many orchids cultivated in Chinese gardens are in the genus of Cymbidiums. These plants are greatly admired in Chinese culture and regarded as one of the 'Four Gentlemen', because of their subtle fragrance, and their ability to survive cold temperatures, and slender leaves which give the plant an elegant appearance. Potted orchids adorn not only gardens but also indoor environments. 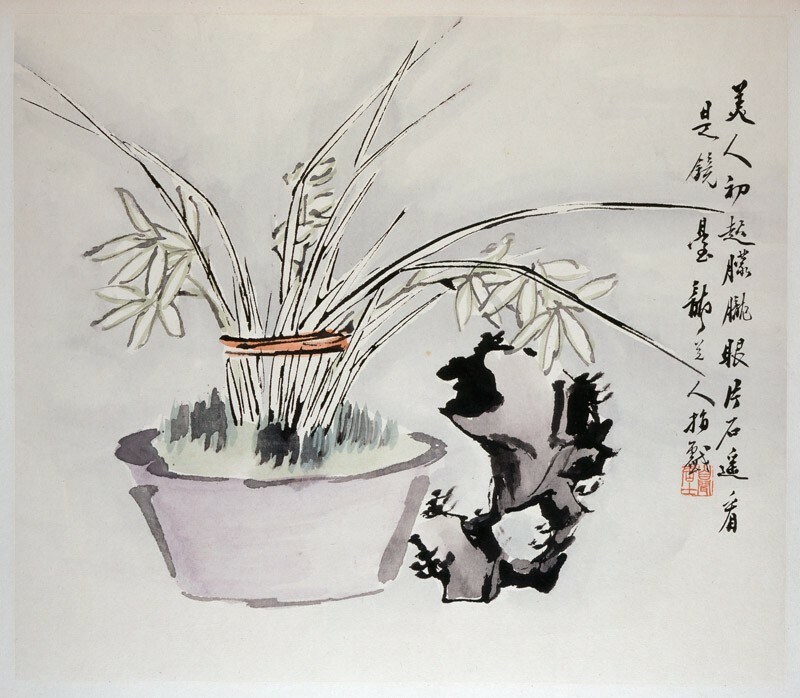 This painting demonstrates typical adornments of a scholar's studio, a potted orchid accompanied by a scholar's rock (see EA2013.3 for an example). Both the plant and the rock evoke a miniature yet idealised natural world. The artist Liu Xiling (1848-1923) started to paint with his fingers and palms after the age of 40. This painting is from an album of Liu's finger paintings. The inscription reads "The scholar's rock looked like a dressing table, from afar in a beauty's eyes, while she was slowly waking up. A playful finger painting by Long Daoren [Liu Xiling]". Active in the Guangxu (1875-1908) period of the Qing dynasty Liu Xiling was from Huayang (present-day Chengdu) in Sichuan province, but as a painter was active in Zhejiang. His painting style and subject matter were inspired by Gao Qipei (q.v. ).